The global CAD market in terms of value is estimated to witness growth at a CAGR of 7.00% between 2017 and 2023. The increasing demand and the growth rate for CAD in the market is attributed to their increasing usage by end-use industries such as automotive, aerospace, industrial machinery,electrical & electronics, pharmaceutical & healthcare, and others. The rising demand is driven by a number of factors such as replacement of manual drafts by CAD drafts in end-use industries, cloud synchronization, inspection agencies, and government initiatives in product development process. The report is a compilation of various segmentations including market breakdown by CAD technology, operating system, product type, end-use applications, and different geographical regions.It also includes sections on competitive insights and market dynamics. Herein the revenue generated from CAD is tracked to calculate the market size. While highlighting the key driving and restraining forces for this market, the report also provides a comprehensive section of the application areas of the CAD market. It also examines the role of the leading market players involved in this market. • What is the global CAD market size in terms of revenue from 2016-2023? • Which is the dominant technology and product type by revenue in the CAD market? • What is the revenue generated by the different CAD based technologies and product types in the global CAD market? • What is the revenue generated in the different applications of the CAD market? • What are the major factors challenging the growth of the global CAD market? • What are the opportunities for the global CAD market? • What is the revenue generated by the different geographic regions in the CAD market? • Which region will lead to the global CAD market by the end of the forecast period? • Which are the existing key market players that have made a mark in the CAD market? The report has put special emphasis on the market share and size ofCATIA, SolidWorks, AutoCAD, AutoCAD LT, Autodesk Inventor, NX and Solidedge, Creo Parametric, SketchUp, Geomagic, and Others. The industry analysis has also been undertaken in order to examine the impact of various factors and understand the overall attractiveness of the industry. The most often used strategy for developing a better hold on to the market has been new product launches and developments, followed by agreements, joint ventures, partnerships & collaborations. The company profile section includes highlights of significant information about the key companies involved, along with their financial summaries and key strategies & developmental activities of recent years. Some of the key players in the CAD market include Dassault Systemes, Autodesk Inc., Siemens PLM Software, PTC Inc., Trimble, MEP, 3D Systems Inc., Kubotek USA, Caddie Software, Aveva Group plc., Hexagon AB, Bentley Systems, Nemetschek SE, BobCAD CAM Inc., Bricsys NV, Robert McNeel& Associates, TurboCAD, and IronCAD LLC.,. CATIA dominated the CAD market accounting for a market share by value in 2016. North America generated the maximum revenue in the year 2016 in the global CAD market followed by Europe and Asia-Pacific. Additionally, APAC has the highest potential to grow in the forecast period due to the presence of emerging economies such as China and India. The factors such as rapid industrialization, increasing investments towards intelligent manufacturing, smart packaging, 3D printing, outsourcing 3D modelling services for architectural and industrial machine parts in low-cost countries will continue to increase the demand for CAD from emerging countries. 10.4 Siemens Product Lifecycle Management Software Inc.
10.15 Advanced Computer Solution Inc. Computer-aided design (CAD) is the use of computer programs to create, modify, analyze, or optimize an engineering two dimensional (2D) or three dimensional (3D) designs. CAD software is used as it provides increased productivity to the designer, improves quality of design, improves communication through documentation, and creation of database for manufacturing. The output provided by CAD is often in the form of electronic files for print, and manufacturing processes. The software is widely used for computer animation and special effects in movies, advertising, and other applications where the graphic design itself is the finished product. In 1950s, the development of CAD began, when Dr. Patrick J. Hanratty developed PRONTO, the first commercial numerical-control programming system. Later, in 1960s, MIT's Lincoln Laboratory introduced SKETCHPAD, which demonstrated the basic principles and feasibility of computer technical drawing. The first CAD systems was majorly used as a replacement of drawing tools. The design engineers started working with 2D CAD to create technical drawing consisting of 2D wireframe primitives such as line, arc, and B spline among others. Due to the advancement in technology, 3D wireframes were introduced in 1960s. For instance, in 1969, MAGI released Syntha Vision, the first commercially available solid modeller program. This enhanced the 3D capabilities of the CAD systems. Presently, the CAD systems are widely accepted by the end-use industries such as automotive, aerospace, industrial machinery, civil and construction, electrical & electronics, pharmaceutical, & healthcare, consumer goods, and others as it provides unique features for the design of product development processes. 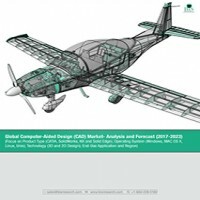 The CADmarket is estimated to reach $11.21 billion by 2023.The overall growth in CAD market is attributed to the superior properties of CAD such as increased productivity, improved product quality, faster development, better visualization of the final product, constituent parts, and sub-assemblies coupled with lower product development cost. The CAD market is driven by a number of factors such as replacement of manual drafts by CAD drafts in end-use industries, cloud synchronization, inspection agencies, and government initiatives in product development process. However, threat of piracy and high cost of implementation of CAD software because of perpetual licensing are expected to hamper the growth of CAD market. Increasing R&D investment in end-use industries, growing demand from emerging economies such as China, Brazil, and India, and development of haptic tools is expected to create opportunities in the global CAD market. 3D design based CAD dominated the global CAD market with the market share of approximately 70% in 2016. 3-D based design offers faster product design deliverables as design cycles are shorter and rationalised. The modernised manufacturing processes displays an enhanced flow of information throughout the product design, delivering higher quality products and uplifting the profit margins. 3D CAD is a step ahead of 2D CAD software, adopted in line with the increasing processing power and graphic displays of computers. The designed products can be viewed and rotated using the three axes – X, Y and Z, via perspectives and isometrics. Windows operating system dominated the global CAD market. Major companies such as Boeing used CATIA, DELMIA, and ENOVIA LCA for the designing of its 777 airline, and 787 series aircraft. CATIA is supported on Windows, UNIX, and Linux among others and is the most widely used CAD product in the end-use industries such as automotive, aerospace, industrial machinery, pharmaceutical, among others for designing of their products. CATIA is one of the leading products in the global CAD market. This is because The CATIA facilitates the complete product development processes from designing to engineering and from styling to systems modelling, within a single integrated platform.Various end-use companies such as FNSS, Eurofighter Typhoon, P3 Voith, Bell Helicopter, Dassault Aviation, Boeing, BMW, Porsche, McLaren Automotive, Chrysler, Honda, Skoda, Bentley Motors Limited, Volvo, Fiat, Benteler International, PSA Peugeot Citroën, Ford, Scania, Hyundai, Tesla Motors, GD Electric Boat, and several other end-use companies have incorporated CATIA for the designing and development of the products. The widespread application of CAD softwarein automotiveaccounted for a major share of the global CAD market in 2016. This is because the use of CAD permits the automotive industry manufacturers to design sophisticated parts and components by using advanced tools to detail the designs. The automotive companies such as Ford, GM, Chrysler, Suzuki, Fiat, Mosler, Nissan, Mazda, Honda, PSA, Renault, BMW, Mitsubishi use CAD software such as NX, CATIA, SolidWorks, SketchUp, NX.For instance, Daimler AG used CATIA offered by Dassault Systemes and later in 2010, the company started using NX offered by Siemens. At present, North America has the largest market share in the CAD market. The major part of the North American share is contributed by the U.S., which accounts for more than 80% of the total revenue generated in 2016. This high growth is attributed to some of the major companies providing CAD software with established bases in the North American countries. For instance, Dassault Systems, a French company providing software for CAD such as SOLIDWORKS, has five R&D centers in North America; out of which four are in the U.S., and one in Canada.Enhanced product visualization, development of cloud-based CAD solutions, increasing demand for reduction in product development cycle are also the factors aiding in such a high growth. Some of the key vendors which have their setups in this region comprise Autodesk Inc., and Bentley Systems Inc. Some of the key players in the CAD market includes Dassault Systemes, Autodesk Inc., Siemens PLM Software, PTC Inc., Trimble, MEP, 3D Systems Inc., Kubotek USA, Caddie Software, Aveva Group plc., Hexagon AB, Bentley Systems, Nemetschek SE, BobCAD CAM Inc., Bricsys NV, Robert McNeel& Associates, TurboCAD, and IronCAD LLC.,. These companies adopted various strategies such as new product launches and developments, agreements, joint ventures, partnerships, & collaborations, mergers & acquisitions, expansions, and others to expand their operations thereby enhancing their share in the CAD market.